Wiz, an intern with the Mage Guild, is paired up with a grizzled veteran who barrels his way through missions. She'd love to change partners, but isn't given a choice, and now they're an unlikely tag team in a basketball game of life and death in the delightful Fantasy Sports #1. This is such a strange beast, but it's absolutely brilliant. On the one hand, it's got the vibe of the early years of Manga, with two comically sized characters paired together, a boss whose chin could double as the letter "V", gigantic eyes on Wiz, and lots of semi-posing when the characters go to speak. It wouldn't be out of place in an anthology with Tezuka, and the influence is clearly shown on Bosma's artistic sleeve. Yet on the other hand, there's so much about this that is perfectly modern. First, the co-main character--and the one who must rise to save the day--is the plucky girl, not a young boy (though visually, she's a bit ambiguous, with no obvious curves and a hairstyle that's similarly suited to either gender). The sport in question is basketball, and they're playing horse. Wiz flips the bad guy--an ancient mummy who morphs into a gigantic, NBA-styled player for the game--the bird at one point. There's the deadpanning skeleton guard, who plays the part of the modern-thinking, self-aware henchman. ("Well, if all the boys is all dead, I guess that makes me Cap'n now, don't it?") Bosma, who works on Stephen Universe for Cartoon Network, throws in the winks and nods that have been a hallmark of modern animation for kids here, mixing the homage to Japanese comics with a flavor that's entirely Millennial. In the wrong hands, this could go terribly wrong, with too many winks and nods, in an attempt to show how clever the creator is. However, Bosma understands what he's trying to do and makes it work with nary a hitch. The story is Shonen at its heart, and follows the pattern to the letter, even if the details along the way are very different: Somewhat unhappy youngster with adults who stifle him/her encounters a monster that is impossibly large and powerful, yet finds a way to win. That's not too far from Dororo or Bleach, but Fantasy Sports approaches things in a way that's fresh and unique. There's just enough winks and nods and the idea that the primary fight is one of hoops that it pulls the story outside the traditional framework enough that anyone not as invested in Shonen stories could (and definitely will) still enjoy this one. It also helps that Bosma's pair of main characters work well together, even if they don't exactly get alone. Wiz is a smart and crafty mage who is just as likely to try to logic the situation out as go in guns blazing. But as we see in the final confrontation, she's willing to take the lead action-wise, if the need calls for it. A lot of kids reading this will see her as an avatar for them, I think--trying to get their side heard when those who "know better" move on ahead anyway. Meanwhile, though Mug seems like a jerk at first meeting (he doesn't want her as his intern anymore than she wants to work with him), he quickly endears himself to the reader by being a silly bull in a China shop, busting up things first and asking questions later. It's obvious he can't win a game of horse, but he doesn't give up, and he's quick to worry that his own failure might harm Wiz. They grow together as characters, which is a lot of fun to read. The final piece in this puzzle is of course, the artwork. 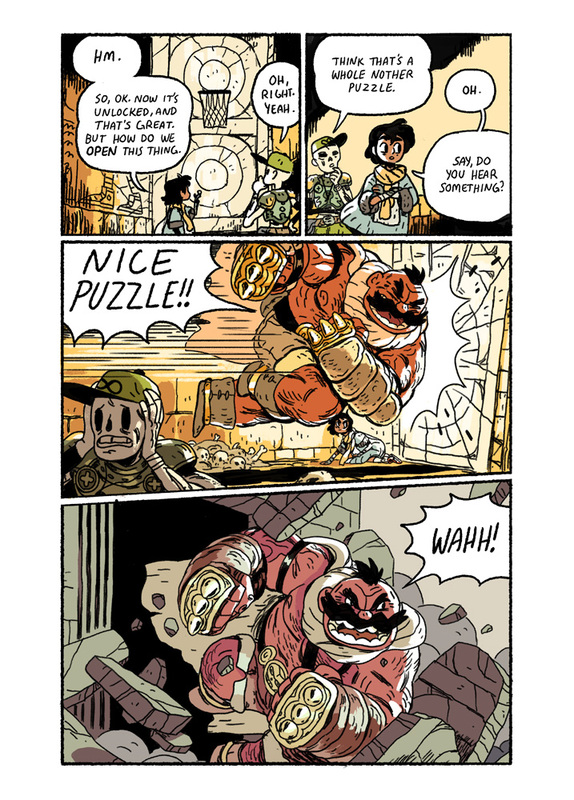 I touched on some of that above, but I want to emphasize again just how well Bosma's managed to capture the feel of an older manga without being a slave to it. For one thing, there's color throughout--a muted palate that lets the linework shine through but allows Bosma to use some dramatic moments with a splash of lightness against the black inks. It really helps highlight the posing moments, comedic emphasis, and other little touches here and there, such as the Mage's office being a surreal Arctic Ocean, with a hazy purple horizon. The action flows from panel to panel, and there's a nice variety among, them, too. It also keeps the comedy going, such as the scenes with the Skeleton Captain or seeing Mug barrel his way through life. There's a lot of things that are driven by the art, like the Mummy's third eye becoming the basketball or allowing the creature to ignore the rules of anatomy in order to heighten the drama. Fantasy Sports promises that it's a "number 1" and I really hope that means there are future installments coming in the years to come. 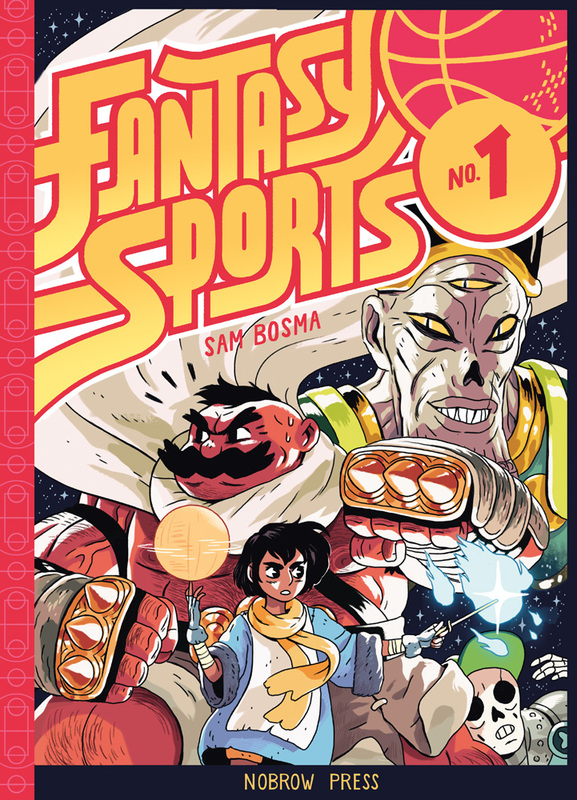 It's yet another great comic from Nobrow, and highly recommended for all ages, manga fans, and those who like irreverent comics in the vein of Adventure Time, Lumberjanes, and similar comics that are either directly from Cartoon Network or inspired by them. This was a joy to read, and I think you'll feel that way, too.